This Father’s Day, celebrate the Father of the Official West Virginia State Ballet! The award-winning documentary will be shown on the Caperton Planetarium Theater screen at the Clay Center as part of FestivALL Charleston! 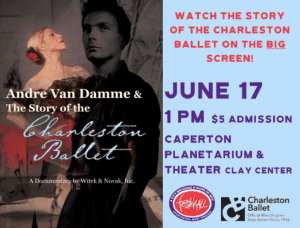 On Sunday, June 17, 2018 at 1:00 p.m. the Charleston Ballet is airing the documentary ‘Andre Van Damme & the Charleston Ballet Story’ at the Clay Center. Call the Charleston Ballet with questions. 304-342-6541.